I’m not much of a baker. I do most of my cooking on the stovetop. But I’ve been getting more and more comfortable with paleo baking recipes. I have a pretty perpetual sweet tooth. But, being prone to low blood sugar and digestive ills, I try to lay off the desserts. And I like them to be a special occasion, something to be savored. Because they are heaven. Sweet, sweet heaven. Needless to say, I don’t generally keep a lot of sweets in the house. 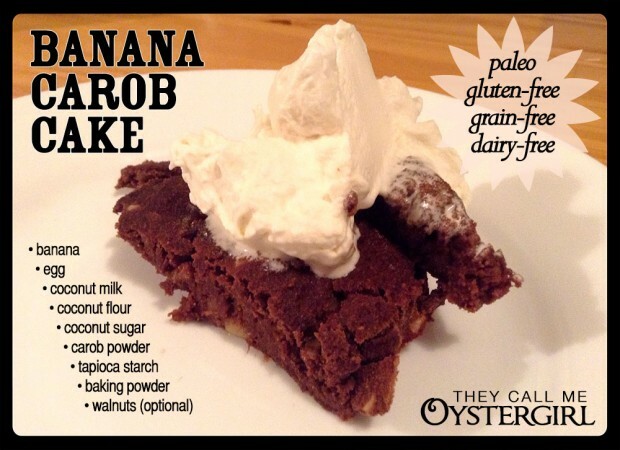 So one day, when a killer sweet tooth attacked me, I rummaged through my pantry and fridge and found only an over-ripe banana and my paleo-friendly baking staples. I got creative and made a banana carob cake. It was delicious: moist, dense, not too sweet. Preheat your oven or toaster oven to 350 degrees F.
Stir those and everything else together until it's a smooth paste. Pat firmly into two single-serving ramekins or one larger one. Bake for 25–30 minutes, until a fork comes out clean. Optional, pictured: Top with homemade whipped cream.